Come mid-July through mid-October, you should consider finding a trail that has a high access road. Because snow sticks around for so long in Western Washington, these places are "easily" accessible for just a few short months. This is a list of the 15 locations on or west of the Cascade Crest. Elevations are approximate. Of course, there are many roads that reach the 4,000 foot level that access amazing places too, but this list has just those above 5,000 feet. Below will soon feature webpages I've made about the road or about trails from the roads. 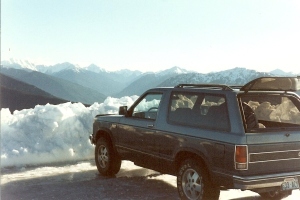 This is the highest point in the State of Washington you can drive. The road was built in 1893 into gold and silver mines where over 1,000 permanent residents were living in what is now wilderness. At a few points, the narrow road hangs along a cliff wall providing magnificent vistas. 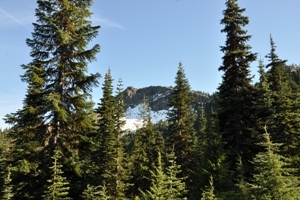 The road ends near tree line, and offers easy access into the vast Pasayten Wilderness, and the most northern section of the Pacific Crest Trail. 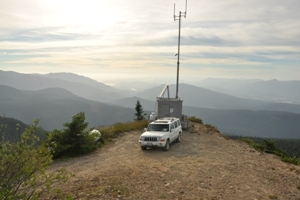 Any visit should include a half-mile walk up the remaining gated section of road to the summit lookout tower of Slate Peak....the true highest point of road in Washington. 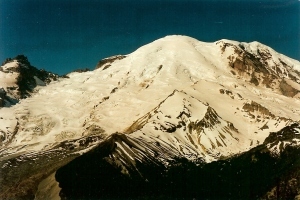 Sunrise is the highest point that can be reached by vehicle at Mount Rainier National Park. It's hard to find a better location with a stunning view of Mt. Rainier, meadows and fields of flowers rising to nearby peaks in all directions. Some distant views on the way up include much of the Cascade Range and Mt. Adams. Usually open from late June to early October, at Sunrise you will find the Sunrise Visitor Center and a Day Lodge with food service and gift shop. 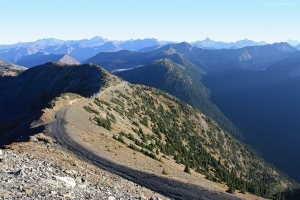 The Obstruction Point Road is Olympic National Park's highest elevation road, leading from Hurricane Ridge eight miles east to Obstruction Point at 6,150 feet. It is typically open mid-July through mid-October. Obstruction Point Road begins at the start of the parking area for the Hurricane Ridge Visitor Center and quietly drops-off the hillside as a dirt road. The road is exceptionally scenic and well maintained for any vehicle. 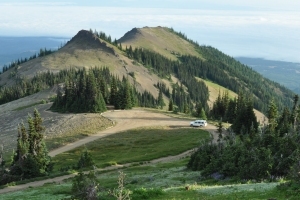 Near the popular Hurricane Ridge is a much lesser known road that climbs from sea-level to similar high meadow country. The catch is that the 18-mile road is gravel for the last 9 miles with steep and narrow sections. Seasoned travelers on gravel roads won't think anything of it but tourists directed there by park brochures seem to think it's a difficult road. The road ends with a high scenic campground, trails and several viewpoints. The easy walk up to the summit of Blue Mountain is a must. 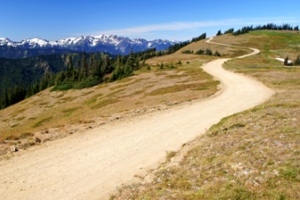 Corral Pass is great high alpine access for hikers and mountain bikers looking for high-country off Highway 410. 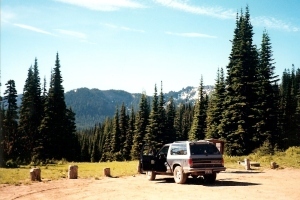 At the pass is a rustic campground with picnic tables and fire rings. Trails go in several directions, many explorations exist far and near. The road is gravel, can get bumpy, and has occasional washouts that close this road so check ahead of time. The quickest way over the Cascades for many Puget Sound residents is to take Highway 410 over Chinook Pass. This scenic road was carved out of rock cliffs in places to reach the scenic gap. The road passes through the east edge of Mt. 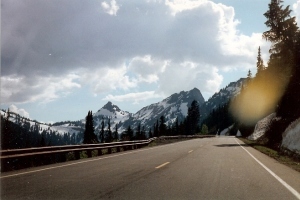 Rainier National Park but no fee is required to drive the road. At the pass is the Pacific Crest Trail with great hiking in both directions. Also, a nature loop goes around Tipsoo Lake, one of the most photographed areas in the state. Probably the most popular road on this list, every visitor to Washington should visit Paradise. The parking area sits in an alpine setting with numerous trails in all directions. With a large visitors center and a National Park lodge, it has the most amenities of any location over 5,000 feet. Winter is also an option, just one of two roads above 5,000 open in winter. Some don't think a road through logging country is worth visiting but even the most sensitive tree hugger can appreciate some of the viewpoints and hikes along this route. For several miles, even the Pacific Crest Trail parallels this road. 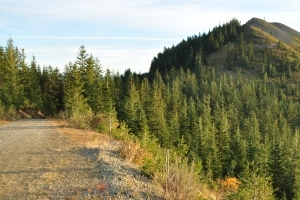 In summer, this ridge-top road is part of a little known route to get from Greenwater to Cle Elum. This road takes visitors to the summit of Burley Mountain where a fire lookout tower is waiting to be explored. The final few feet is exciting as the road is on a narrow ridge. Forest Road 77 continues from below the Burley Mountain lookout to the French Point area, a former lookout as well. One of the easiest ways from South Puget Sound to get high and view Mt. Rainier for a sunrise or sunset, the well graded gravel road up to Sun Top is a favorite for many. Often gated a half mile below the lookout, go mid-summer if you don't want to walk it. High access into the Northwest corner of Mt. 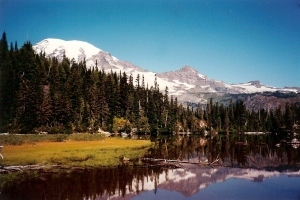 Rainier National Park is managed by driving the Mowich Lake Road, which ends at a walk-in campground along side scenic Mowich Lake. Several trails fan out from the parking area. The road is unpaved after the first three miles but is well graded most of the time to the lake. It is generally open mid-July to mid-October. There are no gates up to the park boundary so it is popular to walk the road from the boundary during the winter, snowshoeing or skiing to the lake. This is the least scenic of any 5,000 foot road I know in Western Washington. It's history can probably be placed to the fire lookout that once stood on top, being built for easier access. Most vehicles can likely reach the Mud Lake trailhead but beyond the next mile is some rough rutted road. This is Jeep country so hopefully the road will stay barrier free. If you drive this road, it's a must to take the short walk up to the top of Hamilton Butte and pay respect to why the road even exists. Few access signs exists and road numbers here have changed 3 times in my lifetime. 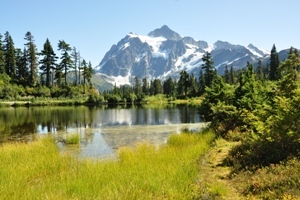 The last few miles of the Mount Baker Highway offer big views at Picture Lake, with the stunning Mt. Shuksan reflection in the water. 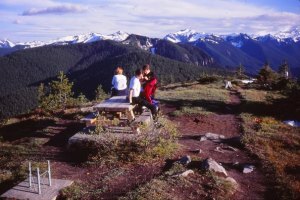 Other stops include scenic Austin Pass Picnic Area and the roads end at Artists Point. With easy paved trails for tourists around the area, the countless photo opportunities exist. For those inclined, several trails depart the Artist Point parking area, giving some of the best views from the first step out of your car. The Twin Lakes Road sneaks you to 5,200 feet in beautiful alpine country. 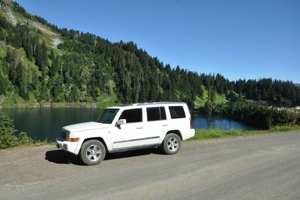 Upon arrival, you find all kinds of alpine primitive car camping set between two wonderful lakes. If this wasn't enough, there are great hiking trails shooting off in several directions. 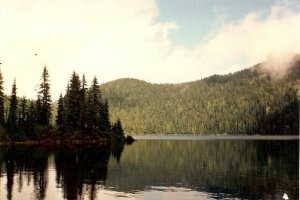 Others just fish the lakes or explore the meadows and subalpine trees. Explorations will reveal great shots of Mount Baker mirrored on the lake. Few car camping locations in Washington are this amazing. The only promoted high road in all the brochures for Olympic National Park, this paved road winds to near the summit of Hurricane Ridge for views across the Olympics. This road is open in the winter although typically just during the weekends and holidays. Tourist trails are found throughout the meadows on top.